Trust Massachusetts' oldest family owned pest control company to protect your family & home. At some point, virtually every home experiences some type of pest problem. Even the cleanest, most well-kept properties face invasion from opportunistic insects, rodents or birds. Unfortunately, not every home enjoys a fast, efficient and long-lasting response to such pests. Problems fester, pest populations grow and the time and cost associated with resolution expands rapidly as well. At American Pest Solutions we provide prompt, 24-hour answering service to our residential customers to ensure your home is protected from the threat of infestation. Pest Guard offers homeowners complete integrated protection against common household pests that may invade the home throughout the year. Our Board Certified Entomologist designed and engineered this home pest control plan. Not only is it designed to address any current pest activity, but also focuses on prevention. With American Pest Solutions on the job, you don’t have to worry about pest problems becoming serious issues. When you partner with American Pest Solutions to protect your home and family we’ll start by sending over one of our state-certified and licensed pest control consultants to evaluate your home and treat for any existing pest infestations. This includes, but is not limited to installing rodent traps in the basement and garage, if applicable and treating peaks, eaves, overhangs, and shutters. After our initial service visit, we’ll visit your home a minimum of 4 times during the 12-month service period. These visits are primarily exterior (after the initial treatment), unless you let us know about a pest problem inside. 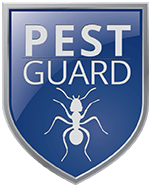 What Pests Are Covered Under Pest Guard? Pest Guard also includes termite coverage. We’ll install and in-ground termite monitoring stations around the exterior perimeter of the home and monitor for activity from April through October. If termites are discovered in any of the stations, we’ll convert to an active baiting program and add additional stations as needed around the dwelling for an additional fee each quarter. Please note, this program is designed to detect termite activity and a more aggressive termite control strategy may be necessary separate from this program. Education is the key to our success. Our board-certified entomologist provides on-going field training and specialized education for all our professional staff, ensuring that you receive the most effective service possible. If you’d like our entomologist to take a look at your property first hand, simply ask. He is available by appointment. When you need us most, American Pest Solutions is only a phone call away.